With our outside of the box creativity and sharp eye for elegance we create images that are classic and timeless. Frame Photography focuses on bringing out the best in you. From baptisms to birthday parties to weddings our photographers capture the essence of the event with an abundance of stills. Your choice of the best pictures is endless. We meet with our clients to explore the vision for the event and while photographing offer a level of customer service that is superb. 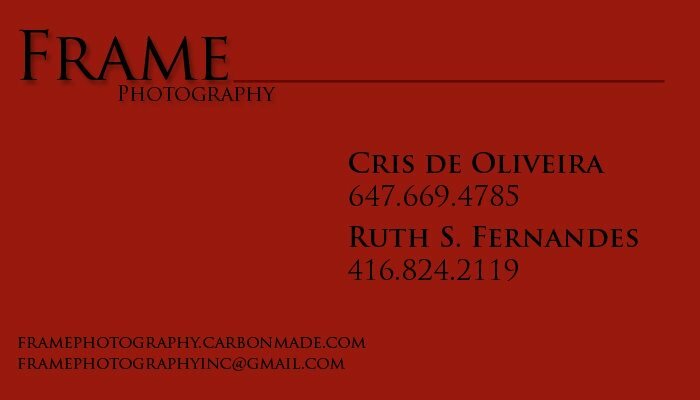 To book a photographer for your next event please call 416-824-2119 / 647-669-4785. Cris looks at the world searching for colours, formats, expressions, contemplating a wonderful sunset, and registering everything that could be framed. Cris has enjoyed being exposed to diversified cultures, having lived in South and North America, Europe and Asia, which has helped her become a diverse artist, but also for the citizen of the world that she likes to be. Photography is a way of life for Ruth, taking her camera anywhere she can and pointing it wherever she can. In addition to her local exhibits, Fernandes has participated in photo competitions around Toronto and internationally. She has photographed around the world including, Hong Kong, Macau, Portugal, Spain, France, Italy, UK, USA, St. Lucia, Barbados, Cuba. Both of them have been invited to collectively participate in 3 separate exhibits in 2009 including Contact Toronto. 2011 and 2012 reserves multiple and exciting exhibits for both artists.